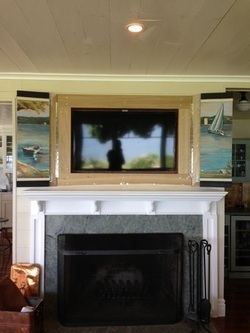 This was 4-panel project to cover a recessed flat screen television. 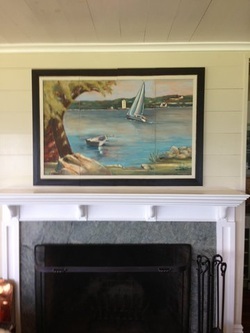 The panels were 1/4 inch Masonite, gessoed and painted with oil. The image is a compressed view from outside the opposite window where this is placed. The next image shows the image when opened to see the television. The picture has been opened so that the television may be viewed. Note the photographer/owner reflected by the tv screen, with the bay behind her silhouette.